While I've wanted to do some quilting for a long time, I've had to restrain myself as I was well aware of its addictive nature. Recently, events have conspired to help me jump in with both feet. The first event was Sharon Boggins/In a Minute Ago online class through Joggles.com. 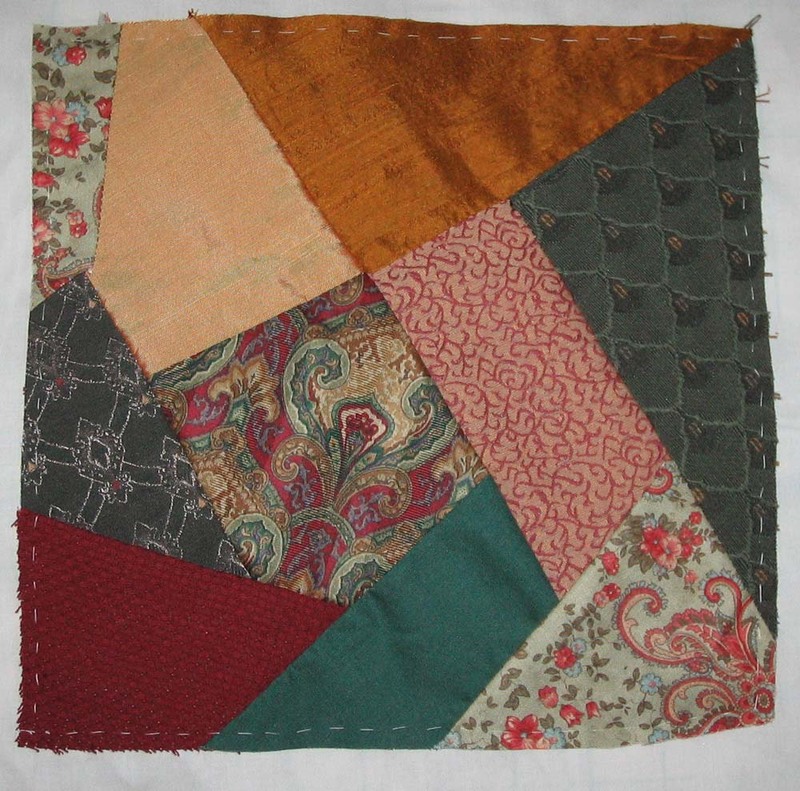 The second was a workshop at Always Quilting which was a color workshop using the format of a crazy quilt block for my local EGA group. The third was a clothing embellishment class for my local EGA Group. All these within a 2 week period. Sooooooooo - this is my first block. With time being very tight (see blog entry on Estrella), I took my fabrics to the color workshop to do the actual work there. The arabesque pattern piece at the "center" was my starting point -- "color inspiration". I then went through stash to find bits which worked with it. quilting cotton with roses (everything I do has to have roses - well not everything....) from the quilt shop to lighten the color scheme and give balance. I am relatively pleased with the first block. Enough that I want to move forward with it even with its problems (see below). It also appears that I like a darker fabric base and will need to consider this when choosing the fibers and embellishements to not make it too dark. First problem in the block development occurred when I realized that if I wanted to use the whole arabesque pattern in the initial fabric it was going to be a much bigger block than optimal. Second problem was that I added the full piece and then cut it down rather than doing the cut a piece close to the "right" size -- 2 different styles of planning a piece out. After getting most of the pieces around the center, I realized I need to sacrifice the "whole pattern" idea and so the tendriled piece cuts across the pattern. Not sure I like the effect, but once it is embellished, it will be okay. The other problem occurred with the squaring up. We looked at the square at 8" - 10" and in between. Since I wanted the arabesque to be near the center it dictated a lot of the alignment. When we took the square down to 9" or below it didn't seem to balance right. I may still take it down from its current 10", but we will see. Also the current lower corner is short by about 1/4" which I can fix in the final binding. Next was to look at the piece and think about how I want the paths to flow. Since this will make a difference in where I put the braids (probably not lace unless I do a cut out piece) and thus, which seams will have the stitching lines, I thought I should draw this out. Blue lines show the main paths - I think. Again, I hope to focus around the arabesque, but as Sharon has pointed out not to the exclusion of the rest. So I need to plan how I want the eye to move about the block and what I want the eye to rest on or move over. I also need to eliminate the eye from following the long lines which occured in the piecing. I've been sitting with the block half way across the room and seeing/imagining what the block wants as its next steps. I think seam stitching next. Red is for the braids and green for the seam stitching. The braids will run on top of the stitching when they intersect. Taking another step back, it is interesting to me, to see where I am willing to really take the time to plan and when I just need to move ahead and take what comes. Some things just jump out. For example, at the quilt shop she had just gotten in the mixed fiber bundles. When I was looking at them, one just said "the block needs me" so I will need to see where they should go. I've also been playing with my stash of threads. I'm thinking that this block will see an interesting mix since it will need shiny and matte bits. I'll end my initial musings here. Those who know me, know that doing webpages is NOT my favorite thing to do, but there will be further installments as the next 4 weeks progress and then we shall see. The whole website will be overhauled later this year and progress on a number of projects and class handouts will go up on the site. My next quilt project is already in the works -- at least the fabric is bought and I'm having a hard time not jumping right into it.